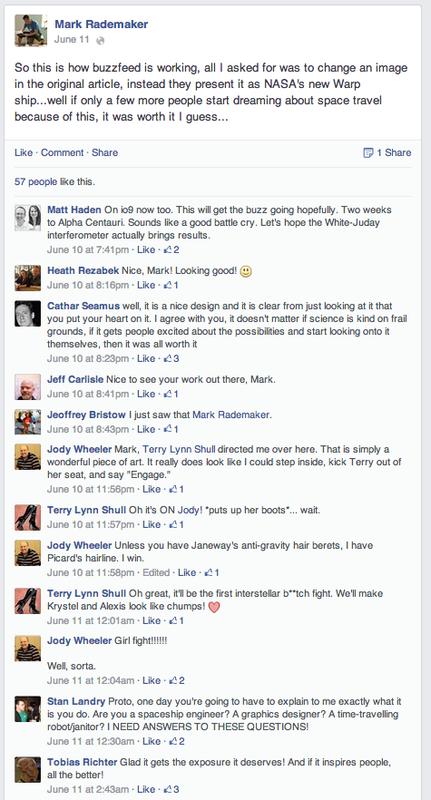 Did a Gizmodo writer and an io9 editor just instigate building a starship? Kinja writer Jesus Diaz may be the P.T. Barnum of starships. 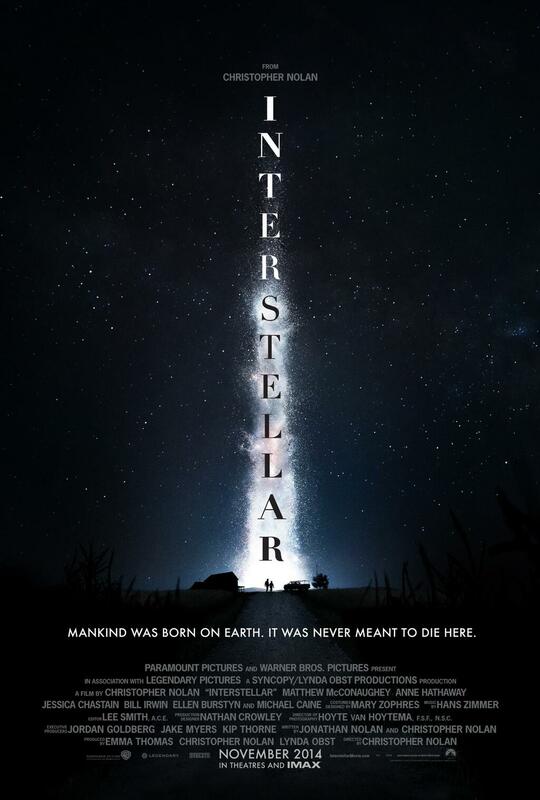 And Kinja editor Annalee Newitz may be the Hari Seldon of interstellar space exploration. For those of us interested in space exploration—particularly interstellar space exploration—these are very good things! 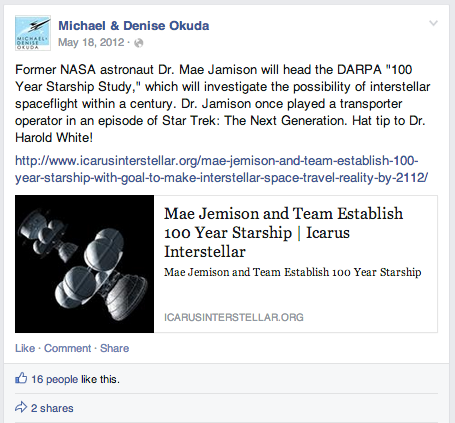 If you have been anywhere on the internet in the past month, you have seen news about NASA’s starship. The person most apparently responsible for this explosive coverage of interstellar space exploration is writer and Gizmodo blogger Jesus Diaz. Yet immediately off the main stage, author and io9 editor-in-chief Annalee Newitz clearly played a prominent role in the story’s masterminding and consequently its blockbuster success. As it is, this dual io9/Gizmodo story triggered the internet’s (and now other media’s) jumping on NASA’s researching—and, let’s face it, (eventual) building—of an actual working starship. 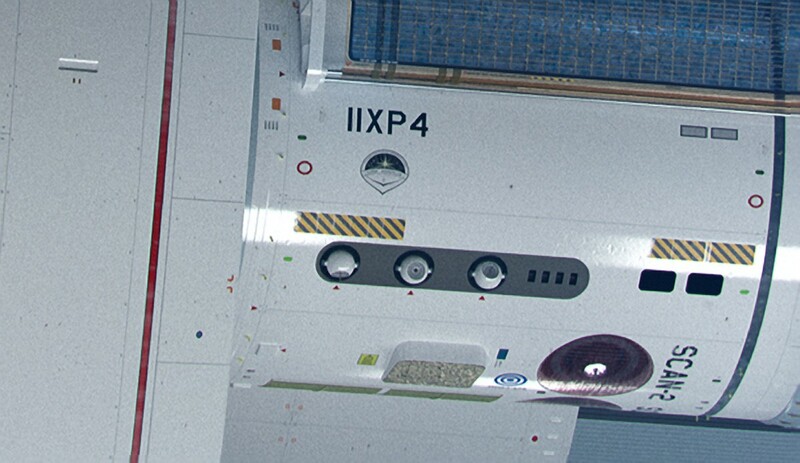 The interstellar tweet that may have got us starships. Before proceeding, it is necessary to get some terms and concepts and key players in order. First, interstellar space travel means traveling between solar systems. We live in a solar system. It has 8 planets, some dwarf planets (like Pluto), and a whole bunch of moons around these planets and dwarf planets. And, most distinctly, our solar system has a sun ie a star. Our sun/star—Sol—is the important thing when it comes to interstellar travel. For us to “do” interstellar travel, we would have to travel or send something from our sun system to another sun system. The next nearest sun/solar system to our own is named Alpha Centauri AB, specifically B. Unlike our sun system, Alpha Centauri is a binary solar system—meaning two stars. (Imagine having two suns. Yep, just like that.) There is Alpha Centauri A and Alpha Centauri B. Alpha Centauri B is the one that is “closest” to us/our sun/solar system. Of course, “closest” is relative. Meaning, Alpha Centauri B is the nearest less Very Far Away from our solar system: Alpha Centauri B is 4.2-4.3 light years from us (give or take). Here is where it gets tricky (and why the Newitz/Diaz’ story has more than a grain of information about interstellar space travel that is 1) importantly true and 2) is like the key which will (at some point) enable actual interstellar space travel): A light year is the distance light travels in a vacuum (which is space, kinda sorta) for the period of one earth year. And that is nearly 6 trillion miles (5,878,499,817 to be exact) or—get this—186,000 miles-per-second. Meaning, in order to travel to the next closest star, Alpha Centauri B, from our own sun system, we would have to move at 186,000 miles-per-second for every second of 4.2 years. And considering the fastest humankind has propelled any object is about 160,000 miles-per-hour (Juno space probe), or an astonishing-but-woefully inadequate 25 miles-per-second, this sort of traditional space travel will never, ever get us to another star system. Got all that? Those are the basics of interstellar space travel. Enter Dr Harold “Sonny” White, Dr Miquel Alcubierre, and artists Mark Okuda, and Mark Rademaker, and by association NASA and Icarus Interstellar. Now, NASA employs Dr Harold White, and to his credit White is showing results of his work which in the least—and excitingly—confirms aspects of his warp field mechanics conjectures. Dr White is friends and professional acquaintances with Star Trek graphic designer Mike Okuda. White and Okuda invited digital artist and Star Trek starship designer Michael Mark Rademaker. As a professional courtesy-slash-pleasure, Rademaker produced the now-famous design of the IXS-Enterprise (IXS-110). It is of course wildly “theoretical”; it is a fantasy ship. Yet what makes it thrilling and exciting and more real than many other such designs is the science and knowledge that went into its creation. After all, all three of these space science professionals are affiliated with Icarus Interstellar. Mark Rademaker, Mike Okuda, and Dr Sonny White all participated in Icarus Interstellar’s 2013 interstellar space summit, Starship Congress. Mike Okuda, Dr Sonny White, and Icarus Interstellar from way back in internet time. For material production, creation, and dissemination of real space science, Icarus Interstellar is to interstellar space research what Marvel Comics is to superhero movies. So that is the background to the point of this post. It is pretty much everything needed to know about humankind’s present grasp of interstellar space exploration in order to fully wrap one’s head about what the Diaz/Newitz’ io9/Gizmodo pieces have wrought. And that is this: Kinza journalist Jesus Diaz Gizomodo report on “NASA’s starship”—here it is, provocatively titled, Holy Crap, NASA’s Interstellar Spaceship Concept is Amazing—has been an important firestarter of a kind of internet media interstellar wildfire. Undoubtedly, the conditions were right for such a blaze (what with Christopher Nolan’s Interstellar movie coming out this year/SpaceX/even Felix Baumgartner jump from “the edge of space”). And said interstellar wildfire continues to burn, picking up a long-tail momentum and currently making the highly-valued transition from internet to traditional media—ie TV, magazines, newspapers. Yet most surprising of all is that Diaz may have unsuspectingly, by dumb luck and sheer good timing, put conceptual gizmos into gear which may very well be triggering events and consequences as exciting as the title of the writer’s Gizmodo piece emphatically suggests. 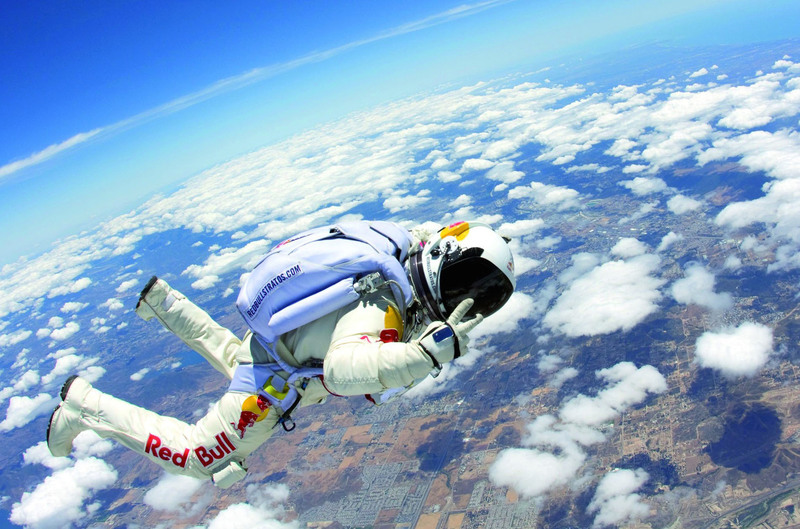 Don’t even get me started about the impact Felix Baumgartner (and Red Bull) has had on space exploration and the internet generation’s imagination. 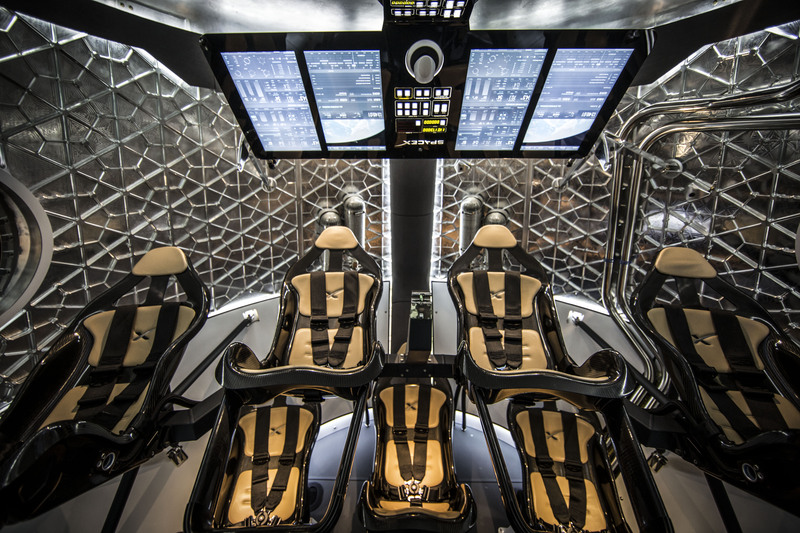 SpaceX has today’s young people dreaming about (new)space. Build a starship? Timing is everything. No doubt, pre-kickoff to Diaz’ Gizmodo story is Mark Rademaker’s posting of the images this past May 19 on his Flickr page. (This “real science” expression of the Starship Enterprise has been under development for some time.) Yet “somehow” (see Mark Rademaker’s FB post below) those photos turned into this piece: Annalee Newitz’ also provocatively titled, Here’s NASA’s New Design for a Warp Drive Ship. Being io9, the story clearly gained traction. There are a hundred or so replies even before Diaz’ piece, which went live four-and-a-half hours later. Either by instruction or inspiration, Diaz’ piece took Newitz’ piece and blew it up. If the tone of the io9 post was thrilled, the tone of the Gizmodo piece was fully grown-up pre-teen space fan goes mind-blown. It wasn’t just geeking, its enthusiasm was so over the top it set the tone for nearly every other piece that followed across the internet. And follow they did. Google alone shows over 200 sites with stories built around the words nasa rademaker white starship enterprise since June 10th. Everything from expected repositories Discovery and Space all the way to mainstream outlets such as NBC and Forbes. Plus tweets, blogs, tumblr and Facebook posts, and so forth. All of which share one common characteristic: We (NASA) are building a starship! 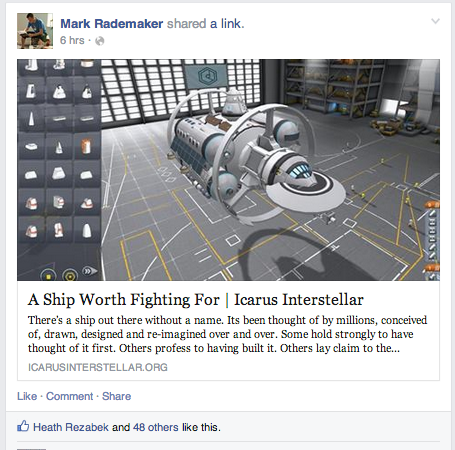 Mark Rademaker on how space science news “happens”. Interestingly, to be precise, we-as-in-NASA are not at this moment building a starship. Not even close. Rather a noted scientist and a noted artist connected among other things by NASA and Icarus Interstellar got together, compared notes, and came up with a beauty of an idealized-and-scientifically-sound model of what an interstellar spacecraft might look like. How many Kerbals does it take to build a scientifically-credible starship designed by NASA scientist Sonny White, and Star Trek artists Mike Okuda and Mark Rademaker? 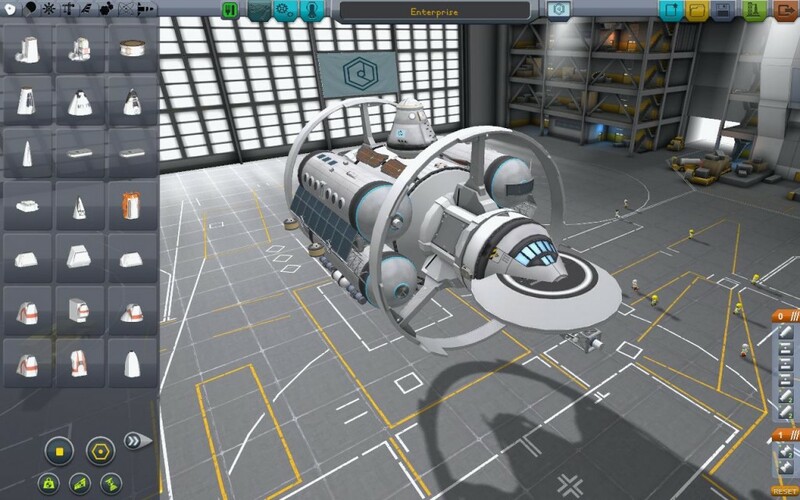 It’s a Kerbal Space Program-version of the IXS Enterprise. And what is Kerbal Space Program? (Very) roughly speaking, it’s the space video game player’s version of Minecraft. Players build—then attempt to launch and fly—working spacecraft. Only there is real science involved. Practical stuff requiring physics and engineering, stuff like weight loads, launch trajectories, aerodynamics, and Advanced Rocket Design. There is no question whatsoever that any number of today’s young KSP players are to become tomorrow’s spaceship designers. In other words, by virtue of the success of the Kinja Media-based news story, the resulting fantastic re-reporting is producing its own “warp bubble”: What is being affected is the imaginations and minds of young people who are definitely math, science, and engineering-oriented. That is, a number of future space professionals who are definitely going on to become not-so proverbial rocket scientists. And Diaz and Newitz’ news story just keeps on keep on. There is obviously no telling where this all leads. It’s too soon to tell. Space exploration may just keep on moving naturally forward. Yet there are milestones and there are milestones. Specifically, what if one of the most iconoclastic of such milestones is happening right now and right in front of our faces? Of all things, what if a successfully contemporary writer (who clearly knows their way around internet-speak) and a formidable editor (with a PhD earned from UC Berkeley) working at Kinja media network are to credit with the veritable direction and unearthing of interstellar space exploration brought about by the media-driven, undertrending embrace of our/humankind’s building a (supposedly conceptual) starship? 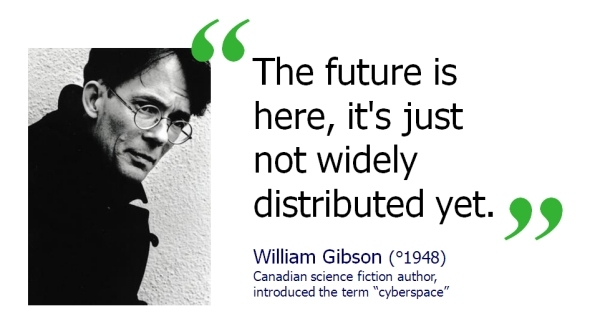 Just ask William Gibson: If you think this is strange, just wait until you see what is coming around the corner.